On March 22, 1979, the UN Security Council passed Resolution 446. It determined that Israeli settlements in Occupied Palestine and other Arab territories "have no legal validity and constitute a serious obstruction to achieving a comprehensive, just and lasting peace in the Middle East." It deplored Israel's refusal to comply with numerous other Security Council resolutions. It called on Israel, "as the occupying Power, to abide scrupulously by the 1949 Fourth Geneva Convention, to rescind its previous measures and to desist from taking any action which would result in changing the legal status and geographical nature and materially affecting the demographic composition of the Arab territories occupied since 1967, including Jerusalem, and, in particular, not to transfer parts of its own civilian population into the occupied Arab territories." It established a "Commission consisting of three" Security Council members. It was charged with examining and assessing the situation with regard to settlements. On July 1, 1979, it reported its findings. They condemned illegal settlement construction. On March 1, 1980, the Security Council passed Resolution 465. It affirmed that Fourth Geneva provisions relating to protecting civilians in time war apply to Occupied Palestine. It deplored "the decision of the Government of Israel to officially support Israeli settlement(s) in Palestinian and other Arab territories occupied since 1967." It commended the work of its Commission. It accepted its conclusions and recommendations. It called on Israel to cooperate with its findings. It determined "that all measures taken by Israel to change the physical character, demographic composition, institutional structure or status of the Palestinian and other Arab territories occupied since 1967, including Jerusalem, or any part thereof, have no legal validity and that Israel's policy and practices of settling parts of its population and new immigrants in those territories constitute a flagrant violation of the Fourth Geneva Convention relative to the Protection of Civilian Persons in Time of War..."
Doing so is a war crime. Responsible Israeli officials are war criminals. To this day, they remain unaccountable. Resolution 465 called on Israel to rescind its illegal measures, "dismantle the existing settlements and in particular to cease, on an urgent basis, the establishment, construction and planning of settlements in the Arab territories occupied since 1967, including Jerusalem." On December 16, 1981, the General Assembly reported on "the Special Committee to Investigate Israeli Practices Affecting Human Rights of the Population of the Occupied Territories." It "condemned the failure of Israel as the occupying Power to acknowledge the applicability of (Fourth Geneva) to the territories it has occupied since 1967, including Jerusalem." It demanded strict Israeli compliance with Fourth Geneva provisions. It called on Member States to take all necessary measures to assure it. It expressed grave concern about the seriousness of the situation in Occupied Palestine. It held Israel fully responsible. Under Prime Minister Menachem Begin (1977 - 1983), things escalated. Heartland/central ridge West Bank settlements were established. Construction tempo increased. In 20 years since Oslo, settler population tripled from about 200,000 to over 600,000. Numbers increase daily. Dispossessed Palestinians have no say. 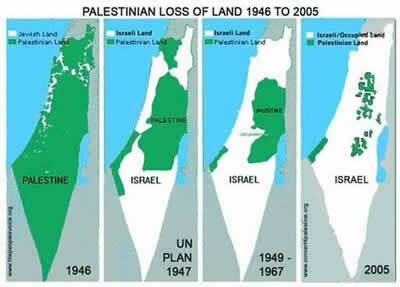 Their land is stolen. They're ethnically cleansed. They're denied all rights. They have none now. They have no credible peace partner. They have no legitimate negotiators representing them. Talks are worthless. They're on their own. Land theft continues daily. Israel's Separation Wall plans annexing around 12% of West Bank/East Jerusalem territory. It'll do so when completed. Building it has nothing to do with security. Israel lies claiming otherwise. It expropriates a sizable share of PA tax revenues. It does so without fulfilling agreed on obligations. It controls about 60% of West Bank territory. It does so through expanding settlements, outposts, closed military zones, tourist sites, commercial areas, no-go ones, increasing East Jerusalem encroachment, Israel's apartheid wall, Jews only roads, and numerous checkpoints and barriers. Palestinians are increasingly isolated. They're denied fundamental rights. They have no say. Collective punishment remains official Israeli policy. So does stealing all valued Judea and Samaria areas. Israel wants them for exclusive Jewish development. A previous article discussed Palestinian prisoner releases. Doing so affords Israel political leverage. Concessions were extracted. Palestinian negotiators agreed not to object to settlement expansions during talks. Israel took full advantage. Since negotiations began in late July, numerous Israeli settlement projects were announced. On August 11, plans for 1,200 new West Bank/East Jerusalem units became known. On August 25, another 1,500 were announced. On October 25, Israeli sources said tenders for 1,700 units would be issued. Various smaller projects are planned. According to Peace Now, more than 16,000 settlement units in various planning and development stages were being discussed by Israeli officials throughout 2013. "No country in the world accepts dictates from other countries where it is permitted to build and where it is not. We plan to continue to market apartments (in settlements) and to build in all parts of the country." Hours after Israel's Tuesday prisoner release, four new projects were announced. Included are 1,500 Ramat Shlomo East Jerusalem units. Development of an archeological and tourism site near Jerusalem's Old City will accompanying them. On October 30, Israel announced plans for 5,000 new units. They include 1,500 East Jerusalem ones. According to Haaretz, planned construction is intended to "offset the release of the Palestinian prisoners earlier this week." "The announcement was made public in the middle of the night." It was done to minimize publicity. Establishing a Mount Scopus Slopes National Park is included. It'll be built on land between the Isawiyah and A-Tur Palestinian neighborhoods. Doing so further isolates them. Stolen land prevents their expansion. Planned construction involves immediate work on 860 units. They're slated for major settlements. They include Ariel, Ma'aleh Adumim, Givat Ze'ev, Betar Ilit, Karnei Shomron and Elkana. Plans for 1,400 units were submitted to Israel's Civil Administration planning committee. Some are intended for major settlements. Others will be built in Shiloh, Talmon, Alei Zahav, Almog and other smaller ones. Plans for 1,100 units were submitted earlier. They'll advance to the next stage of the process. According to Likud MK Ofir Akunis, "building in Judea and Samaria will continue and be intensified." Doing so puts a lie to so-called peace talks. They were dead on arrival anyway. Continued settlement construction clarifies it for doubters. "Municipality officers escorted by Israeli soldiers issued demolition warrants for thousands of Palestinian homes in the East Jerusalem neighborhoods of Ras Khamis and Ras Shahada on Friday, a local Palestinian official said." Other earmarked buildings include a mosque and newly built school. Jamil Sanduqa chairs a Ras Khamis development committee. "The orders came very shortly after incumbent mayor Nir Barakat has been elected for a new term," he said. According to OCHA, Israel destroyed over 500 West Bank Palestinian properties this year. They're mostly in East Jerusalem. They're on Palestinian land. They're to make way for exclusive Jewish development. Doing so involves ethnically cleansing Palestinians lawlessly. It's longstanding Israeli policy. World leaders turn a blind eye to brazen violations of international law. Settlement expansions and other exclusive Jewish development show "Israel is a state that doesn't abide by international law and continues to put obstacles in the way of peace." It bears repeating. Abbas sold out. He agreed to let construction continue during talks. They're excluded from discussions. Abbas surrendered to US/Israeli demands. He sold out his own people in the process. He's a longtime Israeli collaborator. He tells constituents one thing. He does another behind their backs. He's done it for many years. Israel knows he's reliable. Israeli settlement expansions go unimpeded on his watch. He shamelessly agreed to sham peace talks. They're rigged. They're doomed to fail. They assure no peace in our time. Palestinians have coup d'etat officials representing them. Daily Israeli crimes of war and against humanity continue during talks. It's hard keeping track. Dozens of weekly neighborhood incursions terrorize residents. Innocent victims are beaten and arrested. On October 31, Israeli soldiers murdered 22-year-old Ahmad Imad tazaz'a. They did so in cold blood. At time same time, they broke into dozens of homes. They did it violently. They ransacked them. They destroyed personal possessions. They kidnapped four Palestinians. Seven others were abducted in a nearby community. Two more were lawlessly arrested in Bethlehem and the Deheisha refuge camp south of the city. These type incidents occur daily. So-called peace talks exclude discussing them. Abbas prefers disingenuous photo-ops. On Tuesday, he "welcomed" released Palestinian prisoners. He did so in Ramallah. He's done nothing throughout his tenure to demand release of thousands held solely for political reasons. He collaborates with Israel. He does so in numerous ways. He does it by targeting Palestinians Israel wants detained. Innocent victims languish in Palestinian jails. They remain as long as Israel wants them held. Daily crimes against humanity continue. Injustice defines Israeli policy. Abbas and co-conspirators collaborate on what demands condemnation. New York Times pro-Israeli bias is longstanding. On August 12, Times editors deceived their readers. They stopped short of full disclosure. They called timing new settlement construction with releasing 26 Palestinian prisoners a delicate balancing act. They claimed doing so "mollif(ies) right-wingers" opposed to prisoner releases. They failed to explain longstanding Israeli policy. It's standard practice to use them for political leverage. New settlement construction announcements usually accompany them. On the one hand, Times editors asked "(w)hy complicate already complicated negotiations? (W)hy add (to) distrust? On the other, they lied saying Abbas negotiates in "good faith." Most important is what they left unsaid. International law is clear and unequivocal. Israeli settlements are illegal. Security Council Resolution 465 called for their dismantling. It said building them constitutes a war crime. Times editors didn't explain. Omitting, sanitizing, or misreporting what readers most need to know is longstanding Times policy. Readers are best served by choosing reliable sources of news, information and analysis.